Who Brews: Black Hops Eggnog Stout? In the second of our Who Brews...? features offering a quick snapshot of some of the newest brewing companies around the country, we turn our attention to the Gold Coast and a trio of mates who, faced with an array of trial batches from which to choose, opted for an Eggnog Stout with which to announce themselves to the world. We're a trio consisting of Michael "Govs" McGovern (above right), Dan Norris (above left) and Eddie Oldfield (above right). Govs is a brewer at Fortitude Brewing. Dan runs a WordPress support startup and is very savvy online and, like all three of us, Eddie is just a massive fan of anything to do with craft beer and this is way more fun than his daily office job. Making beer and getting it into bars is a journey, and a lot happens along the way that the average drinker wouldn't be aware of. We want to take them along with us so we've set up a blog where we are sharing everything we learn. So far people have been digging it. We've detailed everything from designing labels, making your own decals and actually brewing the beer. We've shared it all via our blog, Facebook page and email list. We brew our 20 litre pilot batches out of Gov's missus' yoga room at their place on Mount Tamborine. We sort of took that over (sorry, Claire), with our 3 vessel H.E.R.M.S system. For the commercial brew of our Eggnog Stout we contract brewed it out of the Beard & Brau brewery at the base of Tamborine Mountain, QLD. It's a farmhouse style brewery, with 4x800L fermenters. We recently released our first commercial beer, which is an Eggnog Stout. This is the beer/concept that brought this whole idea to life, so naturally it would be our first release. It's a dry Irish stout, with characteristics of Eggnog. There is no egg in it nor does it look or taste like custard. Some of the flavors in Eggnog can be quite overpowering, so the balance was something we worked hard on achieving. First and foremost it had to taste like a stout, but with eggnoggy characteristics. We used 11 bottles of brandy, 30 odd vanilla beans and a dash of nutmeg and cinnamon to achieve this. In fact we published our pilot batch recipe on our blog www.blackhops.com.au/blog. We've also been working on a bunch of other styles: American Black, Farmhouse Pale Ales, big dark Belgians, a Scotch Ale and an Aussie Pale to name a few. We've given a few out to mates, but mostly we've drunk it ourselves. Splitting a 20 litre batch between three doesn't go very far. We kegged the entire batch of our Eggnog Stout (14 in total), which is currently available throughout Brisbane. We had our launch on November 2 at Hoo Ha Bar which was an awesome feeling. Since then it's been popping up at all the good bars in Brisbane, Gold Coast and one even went up to Toowoomba. Here is a full list of places who have received a keg. Brisbane is such an amazing place to be a craft beer drinker. It's such a supportive community and we've met lots of great people as a result of putting the beer out there. What's the inspiration behind the brewery name? One of the local beer bloggers (www.brewedcrudeandbitter.com) wrote an article about us, his title was: "The least covert operation in history", we couldn't have said it better. It's a bit of a play on words obviously, but our whole sharing the journey made it fairly ironic as well. Well, Gov's probably has some growlers of Fortitude/Noisy Minor in his fridge, as well as some Black Hops pilot brews. Dan and Ed live a few k's from Burleigh Brewing so usually always have some 28 pale ales or FIGJAMs as a go to beer. And which beers are found in your fridge(s) most frequently? Other than that we are all just into trying everything and anything new; there wouldn't be many new beers that have come out in the last few years we haven't tried. Saison Dupont is Ed's special occasion beer, so we like to have one there just in case, you know, something special happens. BrewCult always excites and impresses us – Hendo sure knows how to use hops. 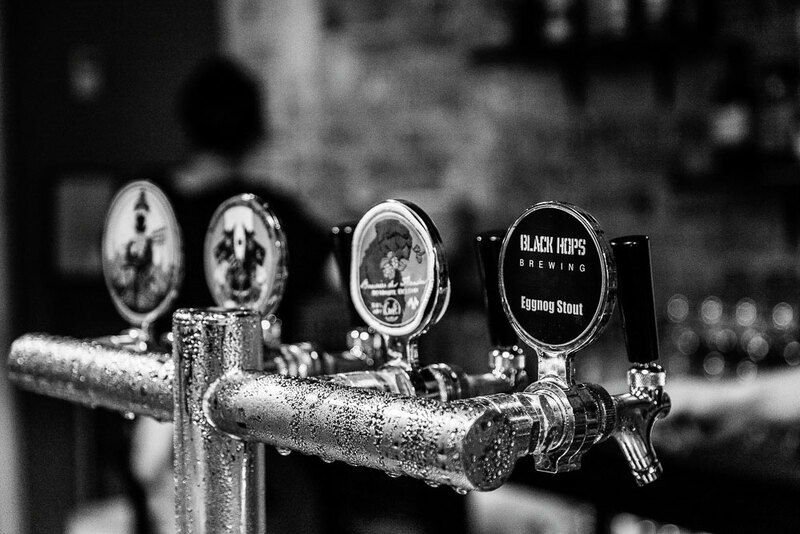 We think Australian craft beer is in good hands; so much new and exciting things happening all over the place. Thanks guys. Go the 'nog! 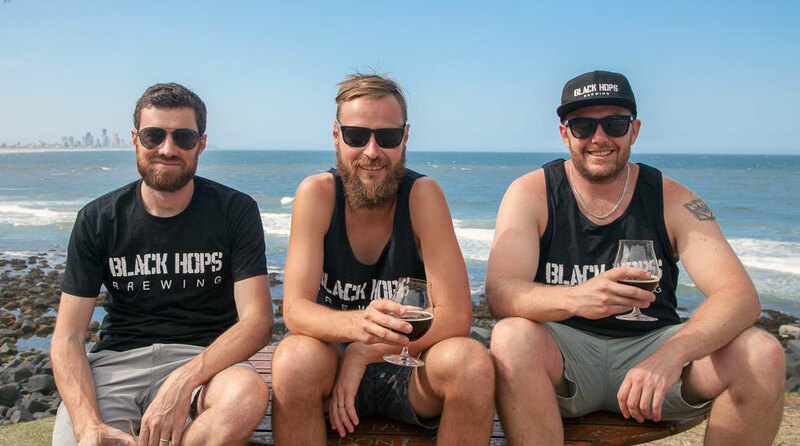 You can find Black Hops on Facebook (as well as the blog linked above).